A long 24 hours of debates, caucuses and voting ended early Wednesday morning as Republicans in the Wisconsin legislature pushed through legislation limiting the powers of incoming Governor Tony Evers and Attorney General Josh Kaul, and limiting the time frame for municipalities to offer early absentee voting. 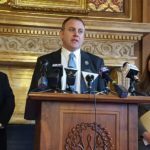 Assembly Minority Leader Gordon Hintz called out the process before the final vote was cast in the Assembly. 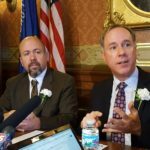 Assembly Speaker Robin Vos chided Democrats for their lack of decorum during the lame duck session, and said the bills are all to even out the powers of government. Democrats have been exaggerating and resorting to hyperbole throughout the debate. The vote is about ensuring equal branches of government exist in #Wisconsin especially during this time of divided government. The entire package of bills now heads to Governor Scott Walker for his signature. He has signaled he’d sign them before he leaves office. Legislation that would have that would protected health care coverage for pre-existing conditions failed to clear a Senate vote Wednesday morning, with all Democrats and two Republicans voting against it. During his reelection campaign, Governor Scott Walker had promised to get that bill enacted into law. Republican Senators David Craig and Chris Kapenga defeated the bill by voting against it. They wanted the state to create a high risk insurance pool, but that was not part of the bill. Also not headed to the governor is a proposal to move the date of Wisconsin’s presidential primary from April to March. That measure never made it out of the legislature’s finance committee earlier this week. A work requirement for single, able-bodied adults who are on BadgerCare. The legislature would also get oversight over any request for federal waivers for welfare programs. In addition, the governor will be prohibited from withdrawing from a multi-state lawsuit that challenges Obamacare. The Legislature would also have new powers to intervene in lawsuits involving the state, an area usually handled by the Attorney General. Financial settlements that the AG negotiates would be subject to legislative oversight. The legislature would get to make additional appointments to the board that controls the Wisconsin Economic Development agency. The legislature also voted to limit early voting to two weeks before an election. A similar bill had been struck down by a federal judge. The current version will also face an almost certain court challenge.